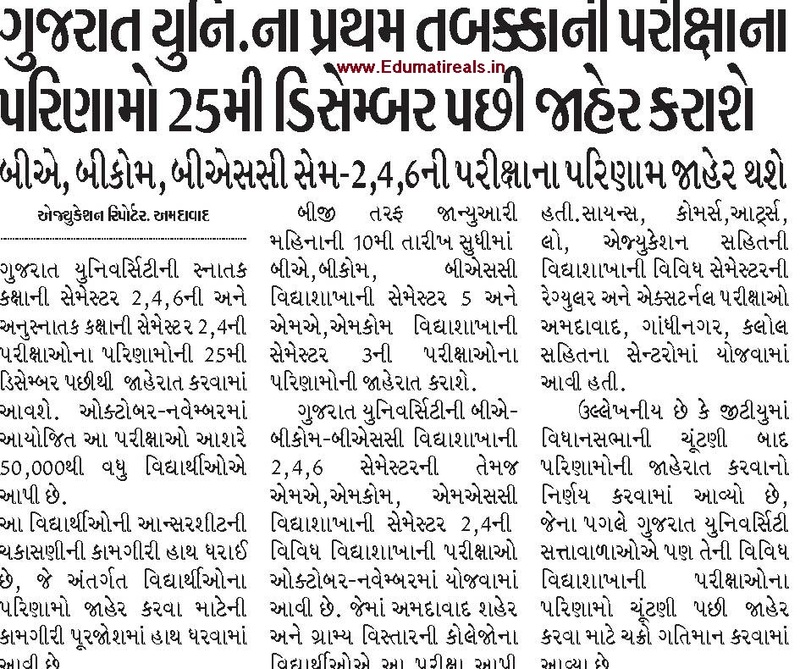 Gujarat University: Results of first phase examination of Gujarat University will be announced after 25th December The Gujarat University's graduate level semester 2,4,6 and postgraduate level semester 2,4 examinations will be announced after 25th December. Approximately 50,000 students have passed the planned exams in October-November. The scrutiny of the students' anesthesia has been undertaken, under which work has been done in full swing to announce the results of the students. On the other hand, the results of the semester 3 examinations of BA, B.Com, BSc faculty semester 5 and MA, MMC faculty will be announced by the 10th of January. Various faculty examinations of 2,4,6 semesters of BA-Bcom-BSc Vidyasacha and MA, Mcom, MSc faculty examinations of Gujarat University have been held in October-November. Students of Ahmedabad city and rural areas were examined. Regular and External examinations of different semester seminars of science, commerce, arts, law, education were held in centers including Ahmedabad, Gandhinagar, Kalol. It is to be mentioned that the decision has been made to announce results after the assembly elections in GTU, after which the Gujarat University authorities have also chalked up to declare the result of its various faculty examinations after the election.